State of Alaska Gold Mining Claims available for lease, sale, or, negotiable agreement for the coming mining season with option to buy at terms we both agreed to accept. If you are interested in buying a claim we will allow small scale testing for a limited time before a purchase decision is made. Also, you may click on “FREE Alaska Adventures” see “Prospectors Dream”. Free Prospecting 1 week or all summer with small equipment. Everything will be in a written agreement. THE CLAIMS are contiguous to a MINING OPERATION ON THE CLAIM to the North, a 160 ACRE STATE CLAIM, owned by someone else. THERE IS A RIGHT-OF-WAY, A GOOD TRAIL, FROM THE HIGHWAY TO OUR CLAIMS WHICH START AT ABOUT 2 MILES. THE TRAIL IS GOOD FOR A 4x4 ATV OR EQUIPMENT. The parties who own the claim to the North took in a D-8, a Case 450, water pumps and a 100+ ton per hour wash plant. At times a 4x4 pickup might get to the claims. 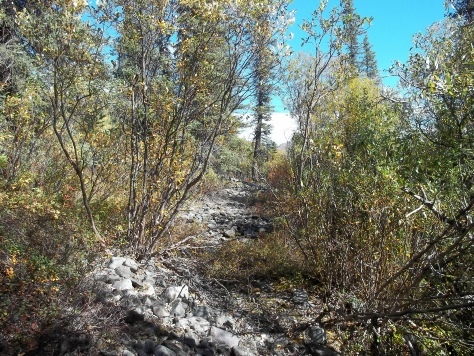 The claims are on Porcupine Creek which crosses the Tok Cutoff HWY which is HWY 1 in Alaska. It drains into the Slana River and into the Copper River, a large gold producing area, with Salmon and many other fish. The claims are along the creek and up the side of the mountains. They are in the yellow oval in the top left photograph and are listed with claim numbers in the Topographic Map. See enlarged photos below. Photos of the claims, the Porcupine Creek and more are on the left and on the right plus there are more enlarged below. If you would like to see some videos click on Destination Alaska Adventures in the center below this text information. Are you a prospector or Gold Miner? Prospectors are born to be prospectors. Even if you have only done prospecting a few times and you love doing it you could be a prospector and if you are a gold miner we could talk about buying or mining a claim. So what is a prospector? From the days of King Solomon in the Bible and most recently in the US and Canada during the late 1800's and early 1900's prospectors searched for gold, silver, copper, gems and more and they were willing to spend days or months in the middle of nowhere looking for these treasures. They are hardy souls who would pack in their grub and tools and are willing to go without the so called comforts of home. Sometimes they found what they were looking for and sometimes they didn't but they didn't give up. They were born to be prospectors and they love the freedom and lifestyle of being a prospector and or course the possibility that they could, in time, make a lot of money from their discovery. These "born to be prospectors" would work at whatever job they could find and save until they had a grubstake and the tools they needed then they would go out in the middle of nowhere and start prospecting. If it is, --- then I may have what you have dreamed about! We have several State of Alaska mining claims that have never been mined located in a proven belt of valuable metals. Our claims are within thirty miles, as the crow flies, from the Nabesna Gold Mine that was discovered back in the early 1900's and also within the same belt of precious metals plus, according to the book "Nabesna Gold", a quartz vein containing up to 256 ounces of gold per ton was discovered. 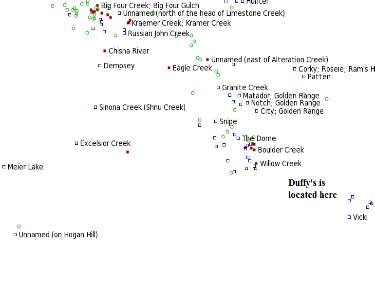 In addition, our claims are within fifty miles of Slate Creek and Miller Gulch which produced about 180,000 ounces of gold. 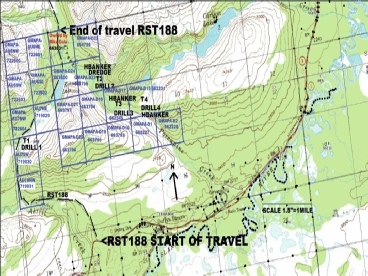 Our Claims are located in the middle between the Nabesna Mine and Slate Creek and they all are located in the yellow oval in the second photo. 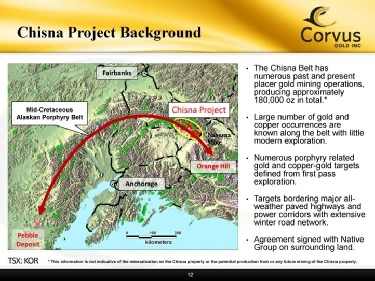 Corvus Gold produced and published this image and they owned claims in the area and have done a lot of exploration on their claims however in early 2016 they sold them to Millrock who plan to do testing and groundwork on the claims. According to research from past federal and state geologists some of our claims could have the potential for good placer gold and rich veins. We have a general idea where to look and possible coordinates. Could our veins have 256 ounces per ton? Plus, many of our claims offer both placer and hardrock mining potential. We also have an area close to the claims where you could camp or park your vehicle and when you need to stop prospecting for a few days and take a break to buy some grub or grab a hot shower you could at one of the businesses located within 15 miles from the parking area. The claims start about two miles from this parking area and continue up to ten miles with access by a decent trail that could during some dry years be used by a pickup truck but an ATV wouldn't have any problems or, if you are as hardy as the old timers, you could walk and pack in your grub and tools. The photographs show some of our gold as well as the Porcupine Creek which flows through our claims and several of the miles of claims we own in the valleys and on the mountains. See enlarged photos below. Late last fall, too late to do gold mining, I found an old collapsed cabin and apparently, by the piled up rocks all along a draw, past mining activity that was performed in the 1920's to the 1930's which was noted on geologists reports in the 1950's. This location is a priority for us to prospect (see photos). I am looking for a few prospectors who are interested in living their Prospectors Dream. We will not pay any wages and we will not supply your tools or grub or supplies or tent or anything else but when you make a valuable discovery we are willing to sell the claim to you at terms we could both agree on or perhaps an agreement for you to mine on the claim which we can discuss. This offer is for someone who wants to explore, test and prospect for potentially good mining areas with the idea that it or they could be mined in the future, or, we could write an agreement for you to mine the claim. We are also open to discussing a possible partnership, or, selling one 160 acre claim or trading it for something we need like an excavator delivered to Alaska with agreeable conditions. 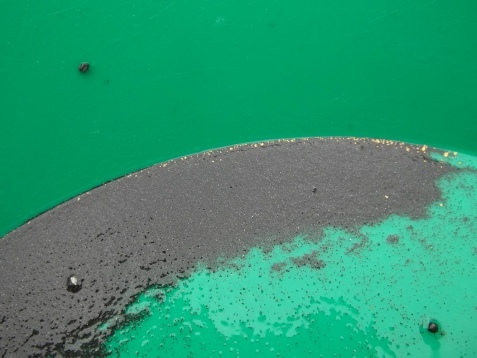 Another option could be that we write an agreement for you to actually do gold mining on one of the claims or an agreement for drilling, trenching or larger scale testing. Everything will be in writing which eliminates confusion and misunderstandings. Are you available to live your dream during the summer in Alaska? If you send an email give me some information about your plans and your name, city, state and phone number! Please use the “Contact” link to send an email. Be certain to give me your name, phone number, city and state and information on your mining plans and I will reply by email or phone. Don’t forget the Destination Alaska Adventures videos below. 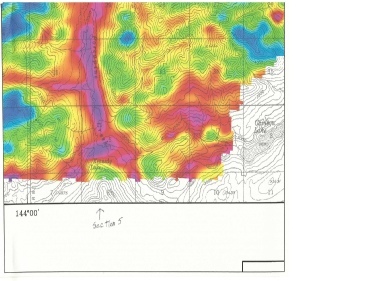 Topographic map of claims & test sites.